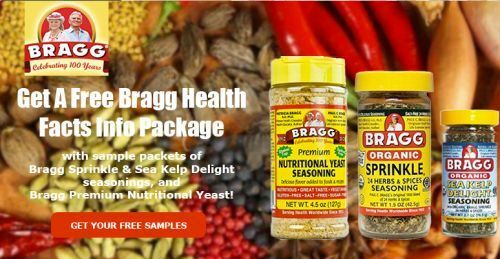 To receive your Free Bragg Health Facts Info Package with sample packets of Bragg Sprinkle & Sea Kelp Delight seasonings, and Bragg Premium Nutritional Yeast, fill out & submit the e-mail form provided (click on the red button below to reach this application form). Submitted information is strictly confidential and is not made available to sources outside Bragg Live Foods / Bragg Health Foundation. This free offer is available only for U.S. postal addresses. Please allow at least 14 days to receive your samples.